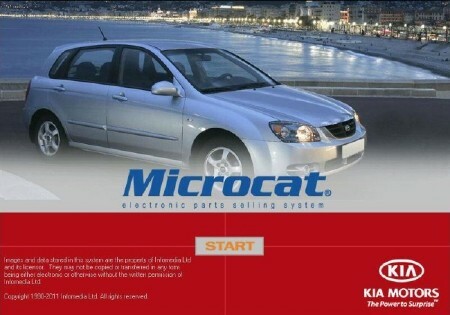 Electronic catalog Microcat V6 for Kia - all models are presented, issued and / or unreleased KIA Motors, except for vehicles intended for inter-market (eg, Rhino), the model divided into groups (cars, SUVs / minivans / vans, commercial) and by region . The catalog will be available for the identification of the vehicle VIN (with filtering part numbers), search by name parts (partial or complete), original number, and also shows the applicability of parts. Also present in the assembly of signaling cards installed KIA. We present all models produced and / or unreleased KIA Motors, except for vehicles intended for inter-market (eg, Rhino), the model divided into groups (cars, SUVs / minivans / vans, commercial) and by region. The catalog will be available for the identification of the vehicle VIN (with filtering part numbers), search by name parts (partial or complete), original number, and also shows the applicability detaley.Imeetsya list of options with details to facilitate selection of the desired number in the absence of VIN-filter. The choice of language is possible to separate the interface of the program, and separately for items of spare parts. A. Mount the disk image. Run setup.exe and follow the prompts on the screen. Type of installation - the "complete", select country and language to your liking, with the regions on the screen to note everything on the screen with the choice of model type - select the "passenger + R / V + commercial." On the screen with a choice list of established models in the bottom of the item is "Microcat V6". It is here, if it is not needed, it is necessary to press the check mark. Two. After installation, to abandon a reboot, go into the folder "windows system32" and delete the file from there "mg16.dll"
Three. Enter the folder "Crack and run the first file" install.reg ", at the windsurfing question answered in the affirmative. Then run the file" install.bat ", open a command prompt, where you will see the implementation process of the file. Instead of each of the commands should be executed spelled out "OK." Press any key to end the run file. 4. For those who want to punch in the program numbers of wines from all regions (except of course wine-s of the internal market) - go to the folder X: KIA_DATA kiac.dat and open the file in the usual Microsoft Excel. In the table, empty the contents of three columns: To_Year, Production_To, Excluded_Countries, except the title, of course. Exit and save the file, ignoring the warning about the loss of some Excel data. Five. Reboot the computer and run the program. 6. If the program is installed for the first time (and not the method of updating), the first run after pressing "Start / Start" in the dialog box, go to the "Administration" and create a new user, specifying the username and password. Then - enter the data in a window and log. Manual install alarms on cars KIA officially sold in Russia, with photos of the main points of connections. Microcat V6 For Kia & Card Download via Hotfile Rapidshare Fileserve Megaupload & FileSonic, Microcat V6 For Kia & Card free torrent downloads included crack, serial, keygen.